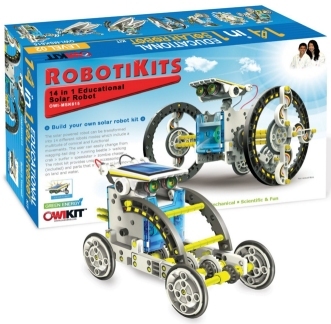 The OWI 14 in 1 Solar Robot Kit looked ideal for the kids (two young boys) who love making toys, especially robotics, whereby you can build different things from the components. 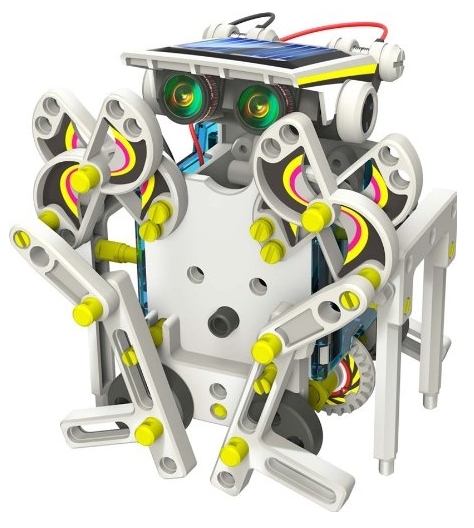 We’ve had hours of fun with basic build your own robot style toys including the non-electrical ones and motorized versions made from cardboard – but the move to the 14-in-1 solar powered robot from OWI was quite a step up in technical terms. On opening the robots box you are presented with all the components – much like a lego set except that you press the parts of a mould initially, as you would with a model airfix. An instruction booklet which shows the assembly details for each robot permutation in the kit is also included. At first it looks a bit daunting, but determined to teach my boys a little bit about solar power I picked out the bits and pieces and started on making the bot which looks like the one shown above. I had completed it in around 25 minutes – but I have to confess – I am not sure an 4 year old could do this. And this is where things get a bit messy – because I have since found out that there are various age recommendations for this – some start at 4 and some at 8. It seems to depend on who is selling this robot. Just something I noticed from different sellers listings at the time I bought it – there are different box styles aswell – some say “OWI” – but some don’t although the kits look identical. This is a picture of the one we ordered two of. The size of some of the robots is actually quite large, similar to an adult fist (perhaps a bit bigger) just to give you a sense of perspective – which is pleasing because sometimes the displayed images can tend to be misleading – not in this case. Clipping the pieces together was easy enough and I would think any child wanting to do experiments with this product, who has completed anything of moderate complexity with lego will have no problem in assembling their robot of choice. Aligning the cogs and wheels can be a bit tricky though as they have to be perfect in order to function correctly. I have seen people whining about this – but I can only assume they have not followed the instructions carefully enough and rushed the build – it always baffles me how people expect everything to be done for them – they simply don’t concentrate or can’t be bothered. In reality, accuracy and precision is key when fitting the components together. Trimming the wheels and cogs to remove any excess plastic – or simply ensuring there is none helps. Three particular models makes use of two pontoons which allow the toy to float on water and move around with propulsion from a wheeled paddle arrangement – a creative angle to this particular kit. The solar panels, photovoltaic cells, are rather “nifty” if I say so myself and sit (as you would expect) on top of each robot type to gather the photons to drive the electric motor. Overall the electronics are very basic, which is good as the focus is on solar power rather than anything more complex where education is concerned. In other words, this kit will use solar power to drive a motor – and that’s it. The mechanics of the snap together pieces do the rest to create basic movements of the head, arms, legs, wheels etc. in rotational or pivotal motion. What about the sunshine? Well solar panels don’t really need very bright sunlight to operate, whilst they may not function at full capacity the darker it gets, normal daylight is sufficient to drive the tiny robotic motor, which doesn’t really have any tremendous load on it!! Ours worked just fine in the kitchen on a tiled floor beneath a window on a fairly cloudy day – no need to worry about batteries running out and having nothing to do whilst they re-charge. In summary I would say this is an ideal educational robot toy for kids within the specified age groups (check the box as there are variants). In our case the kids race to build the current style and then pretend the creations are playing with each other! They don’t want to dismantle the latest one to build the next one though – but I am not going to buy 28 kits! In the price range, I would also say this is far more fun than a bog standard lego set which tends to be quite a lot more expensive for what you get – typically due (I would guess) to the associated branding with movies and other characters, something this product does not have to suffer. Additionally it would be of equal interest to both boys and girls so long as there is an interest present in constructing and electronics. 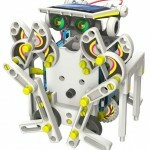 - Great for kids education. - Learn about solar power. - Basic kit yet extensive model range. - A bit flimsy but good value. How to Build Confidence in Kids with “Jack Cherry and the Juicer”!